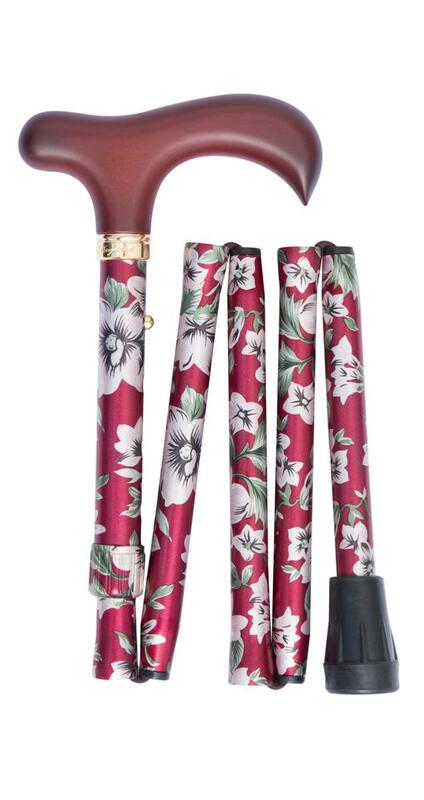 Chic, neat and compact, this quality folding cane folds into five sections instead of the usual four, making it more compact when folded and easier to fit into a handbag or similar. 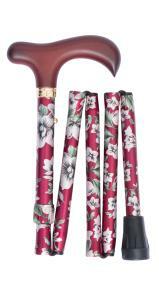 The satin-finish aluminium shaft features a sophisticated pattern of cream flowers with green foliage on a burgundy background. The supportive derby handle is made from wood, lacquered an attractive burgundy shade. The cane is fitted with a smart brass collar and non-slip black rubber ferrule. The height is easily adjustable from 81 to 89cm. Item weight 260g. Ferrule size 16mm.